Title: LETTRES DE NINON DE L'ENCLOS au Marquis de Sévigné [Bound with] LA QUINZAINE ANGLOISE A PARIS, ou L'Art de s'y Ruiner en peu de Tems. Description: Amsterdam, [London, but actually Paris], chez François Joly; [2nd work no publisher given] 1769, [1776 or 1777] Engraved portrait frontispiece of Ninon de l'Enclos. . TWO WORKS BOUND IN ONE VOLUME Duodecimo 18th century half-calf, marbled boards (hinges cracked but firm/head & foot of spine chipped/tips worn/spine label missing) Armorial bookplate William Powlett Powlett on front endpaper. First work (Ninon) in three Parts: , viii, 120; , viii, 120; , 128. Second work (Quinzaine) missing 1st 2 leaves including titlepage, begins with the Preface at aiii followed by the second title: [12 of xvi} 287,  pp. *Two books considered improper at the time,are here bound together,the first work disguising the presence of the second so that the spine reads only "Ninon de l'Enclos &c" Quinzaine .. is an amusing satirical work by James (or Jean Jacques) Rutledge which was published without attribution to him, first printing in 1776. DNB's article on Rutledge says: "this sketch, which depicts the rapidity with which a 'plunger' may be reduced to destitution by the harpies of Paris, and purports to be a posthumous work by Sterne, to whose works it bears no sort of resemblance. .. The writer states that attempts had been made to suppress the work in Paris". 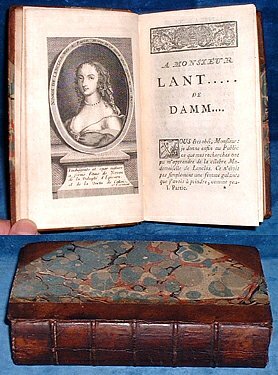 A later translation into English appeared as 'The Englishman's Fortnight in Paris' but there seem to be only two editions in French - 1776 and 1777. Both appeared without attribution to Rutledge and both given as London but probably printed in Paris, their collations also seem to be the same. Hence,lacking the titlepage in this copy,we cannot determine whether it is 1776 or 1777.